Modern 3D games under Linux used to be challenging even before the first round of play, with tricky settings in Wine or installation of its commercial version, Cedega. Crude hacks in the settings files required that gamers have a high level of experience with Linux. Numerous strange bugs kept appearing in the games, but the game providers didn't care because they occurred only on Linux, a strange niche operating system, instead of the officially supported Windows platform. The year 2010 saw changes in this unpleasant state of affairs when some game developers started turning to Java as an operating-system-agnostic development language. Mojang's Minecraft enjoyed outstanding success as an independent title, running under Windows and Linux almost equally well – some even said it ran better under Linux. Around the same time, the game provider Valve decided to develop hardware in addition to its Steam platform . When deciding on an operating system for their Steam Box, a gaming console, Valve chose Debian Linux. One of the many reasons for this choice was probably that highly technical 3D games native to Linux already existed at the time. The ego shooter Sauerbraten has been demonstrating since 2003 that a gamer can manage to roam smoothly around 3D landscapes, fight, and die under Linux. Additionally, the Valve managing director and co-founder Gabe Newell was deeply disappointed with Microsoft Windows 8. He described it as a catastrophe for the PC as an open system for gamers and issued urgent recommendations for a change to Linux . 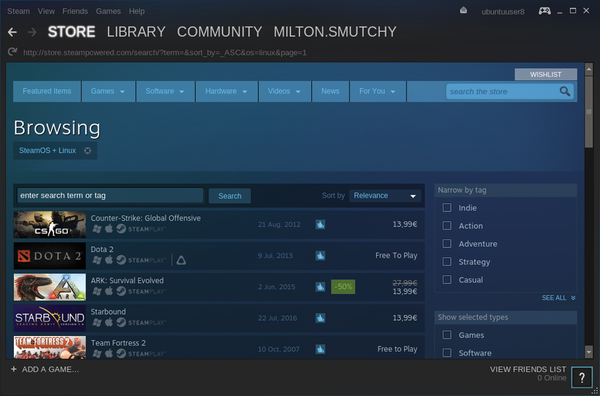 At the end of 2015, the search function for Steam  reported that more than 1,500 games on the Steam platform officially ran under Linux (Figure 1). At the same time, development of native Linux games forged ahead, and some of these games are also available with a free license. I tried out two Steam offerings under Linux – Cities: Skyliness  and ARK: Survival Evolved . I also tried 0 A.D. , which is a native real-time strategy game with a free license. The "Test Equipment" box details the hardware used in the tests. I wanted to find out how modern video games work under Linux on computers that users would consider completely average. I used a Lenovo IdeaPad laptop with an Intel Core i5 CPU and 8GB of working memory. It was equipped with an Nvidia GT 620 graphics chip with 1GB of shared memory. The other machine was an Intel Core i5 desktop PC with 8GB of RAM and an Nvidia GeForce GTX 750Ti graphics card with its own 2GB of memory. Both computers are normally used as a standard PC with Ubuntu. The systems were optimized with the KXStudio extensions and the low-latency kernel from Ubuntu Studio for music production. If you want to play Steam games, you have to register on the Steam website and then download and install the Steam client for Linux. Currently the program forces users of Ubuntu 16.04 to retrofit. (See the info box titled "Steam on Ubuntu 16.04.") The entire registration procedure comprises just a few steps and asks only for an email address, password, and username. Ideally, you can specify a telephone number that can be used in the event of problems to verify the account, although this is not needed most of the time. If you forget your password, Steam will send the data necessary for a reset to the registered email address, just as other providers do. Reports about various problems with Steam have been mounting since Ubuntu officially became available in version 16.04 LTS in April. Most of these reports are related to the system libraries delivered by Steam. Steam delivers its own version of essential files, like libstdc++.so , and apparently some of the files do not work with the system environments of very current Linux versions. Users of other Linux distributions with current AMD graphics drivers report problems, and current Radeon drivers do not work with the library versions of the Steam run time. However, the solutions described here should be helpful even in these situations. Digital Rights Management (DRM) technology is a mechanism that could more aptly be called Digital Restrictions Management. This technology assumes control over access by the user to files on their own computer and over various hardware interfaces, particularly those involved in transferring data to audio and video cards and the accompanying output devices. Proprietary kernel modules for Nvidia and AMD graphics chips support parts of this technology, and applications like Steam rely on it. This situation has led to increasingly strident criticism being leveled by the Linux world against the Steam manufacturer Valve. It is only fair to add that Valve advised game providers early on to stay away from DRM. Connecting DRM files to the hardware of a system is done as a means of directly controlling loading and processing of the data, but it requires significant computing outlays. Instead of taking this approach, Steam's Custom Executable Generation (CEG)  is based on a connection between the software and the user account. The advantage for users is that this technology does not reach into the system. It stays within the game software that Steam sells. It can only be called up when connected through a Steam account. This makes it both possible and permissible to install the software on multiple computers. However, the approach does not allow multiple simultaneous starts from different computers. Each time the user switches to a different computer, it becomes necessary to enter a security code that Steam has sent by email. The final point to address is how the user plays when no Internet access is available. During testing, both of the games from Steam functioned normally without an Internet connection. Steam offers an offline mode, and the games I tested started as they were supposed to. With ARK, you can even start a local undedicated server; of course, there is only one visitor. Those looking for Steam games that have no copy restrictions whatsoever will find several titles that can be played without starting the Steam client. However the platform does not officially support for these games. On the other hand, they are not subject to the copy protection mechanism employed by Steam or the annoying DRM technology. The Wikia.com page  devoted to Steam contains a list of these games. The caveat is that only about a third of the titles mentioned are suitable for Linux. To purchase games sold for a fee you need a credit card or a PayPal account. Other payment alternatives include direct withdrawals from your bank account or prepaid cards that can be purchased in stores. There are also many store locations where the games, like products from Google Play and iTunes, can be purchased. The Steam client requires a login when called for the first time. Thereafter, the program starts without asking for a password. Steam works well across platforms – which you'll notice in the fluid displays – even though it was built for Linux-based hardware. However, the program is not presented as a piece of software that is deeply embedded in the Linux desktop. For instance, it ignores system language settings and always loads in English. Steam activates an icon in the system tray that hides a menu you can access with a right-click. It contains an option for Settings where you can easily change languages. This right-click menu is also the only place to go to end Steam. Closing the main window only ends its own module, but the back end continues to run. The Steam shop is convenient and free of clutter. The search function comes with a list that includes simple icons and short descriptions. One click in the list displays the page for the game together with a demo and useful information about the system requirements. Two clicks with the mouse suffice to buy a game (Figure 2). The game then appears in the profile, but only in the list of purchased items. 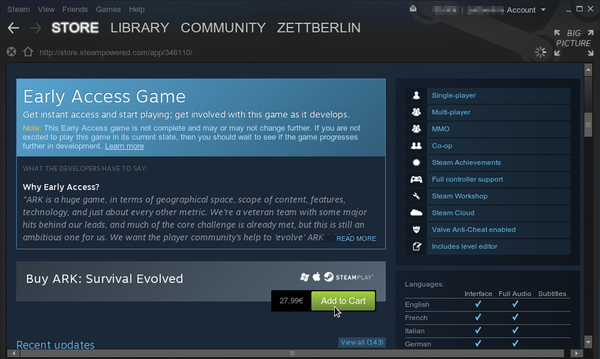 Figure 2: Steam gives detailed information about the fact that ARK is still under development. The "SteamPlay" log indicates official Linux support. To download the game, click on the Install button, and it is installed in your home directory. If the procedure is cancelled, Steam will first check the size of available memory. If the partition fails with the home directory, Steam offers to install the game on a different data storage device. It can take a little while to complete installation. For example, ARK: Survival Evolved comprises 15GB of data. This huge download is a promise of things to come. ARK is in its early access beta phase. Studio Wildcard has designed the game with fantastic attention to detail. Even the landscape looks remarkably genuine, and the 200 plus animal species that populate the landscape have been created with the standard of artistry found in epic movies like Jurassic Park. Their artificial intelligence has also been programmed with a love of detail that makes for an incredibly convincing experience of interactions that occur among the animals themselves and between the animals and the gamer (Figure 3). Figure 3: Wilderness and wild animals make ARK a thrilling experience. An update released on the day before the publication deadline added considerably more dramatic weather attributes. The only thing that jerks the gamer back into reality is the motion animation, which is sometimes bizarre. For instance, a Parasaurolophus stuck halfway under a boulder can go into a continuous loop of strange contortions. The mixture of survival, adventures, and sandboxes is nonetheless appealing. Those who proceed strategically and learn which animals can be hunted and which animals are better avoided advance quickly. Most of the animals can be tamed with a little experience. When one of the living fossils gets stunned and then fed, you get a non-player animal that transports, loads, and defends you against other monsters and takes you on a ride through the wilderness. The original concept behind Cities: Skylines was that it was supposed to be a single-player game. The chief developer Mariina Hallikainen explained in an interview with PC Gamer magazine in 2015 that no multiplayer mode was in the works. It's very different with the other two candidates. The parties and alliances in 0 A.D. and the tribes in ARK emphasize a shared experience. Therefore both games were built from the beginning as server-client systems. Hundreds of servers host ARK worlds. Most of these are found in the Nitrado  network, a gaming platform on which official servers are centrally maintained by Studio Wildcard. As a result, this platform always has the most recent version of a game, which you need to install on the client side. 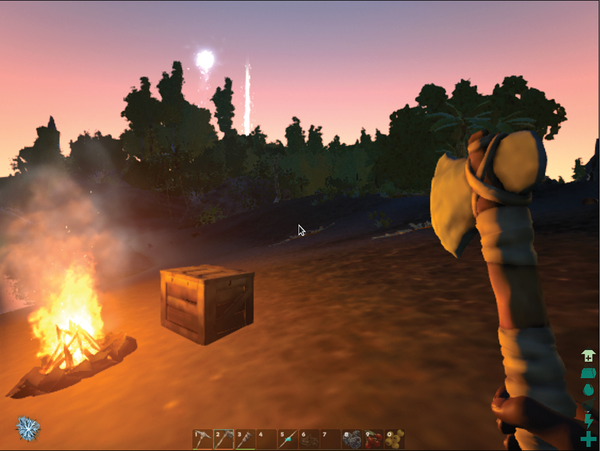 The official servers use "The Island" map for the gaming environment, and for a short time now, "The Center," as well . Mods are not supported. Private servers often offer additional maps, and they allow mods. Studio Wildcard expressly supports the construction of independent servers. The system requirements can be somewhat daunting. They include a 64-bit Linux system with 8GB of working memory and an Intel Core i5 quad-core processor, at the minimum. This weeds out the possibility of spending a nominal amount to rent a Vserver that suffices, for example, for five to six Minecraft gamers. To lower the entry barrier, Studio Wildcard offers to rent pre-configured servers. As a rule, these are less expensive than other servers that would be suitable for the game. Studio Wildcard also offers free, downloadable software packages for operating the servers. The packages are based, like ARK itself, on the Shooter Game Unreal  gaming engine. Even the basic ARK for home use, operating as a local undedicated server, offers the possibility of inviting additional players. During testing, it quickly became apparent that it is necessary to have a desktop computer. Tests on the laptop showed it was possible to generate a connection to the local server, but in the process of doing so, it used half of the 8GB of RAM. Moreover, the CPU indicator showed a load of around 150 percent with top , causing the fan to run at top speeds. Timeouts and the heavy load made it clear that a standard PC gamer is preferable for participants in these kinds of games. 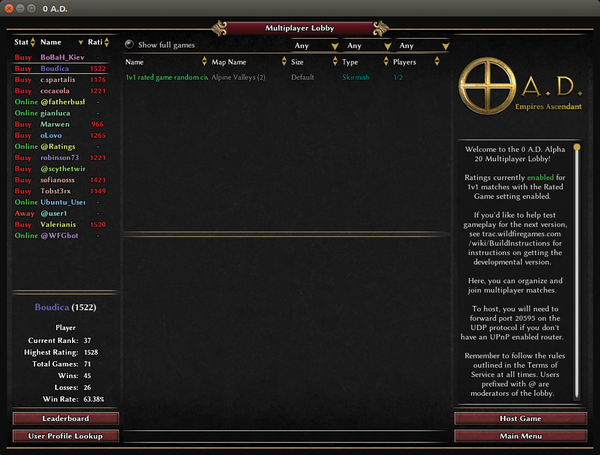 Currently, 0 A.D. has no server infrastructure and no dedicated server version either. Instead, the server starts itself. For this to happen, you should call Multiplayer | Multiplayer Lobby from the menu (Figure 4). This is where you can host a game or join rounds with other players. The lobby is not full of visitors, but if you can wait around for a few minutes, other players will appear. The host player waits in a configuration view for other players who are waiting to begin rounds of single-player games. The settings for network play are selected in exactly the same way as they are for single-player mode, which means the host can discuss the settings for the game in chat sessions and create alliances between players and their preferred team members. Multiplayer mode also exhibits the professionalism of the developers. The only issues that dim the luster a bit are small bugs in the game mechanics. All of the important elements work flawlessly – online, as well. In PvP mode, human gamers play against one another either as individuals or in so called ARK "tribes." The idea is to see who can dominate the playing field. In PvE mode, gamers try to protect themselves against the elements either by working together or collaboratively. The elements include monsters and other dangers. Cooperation is permitted but gamers are supposed to avoid animosities. 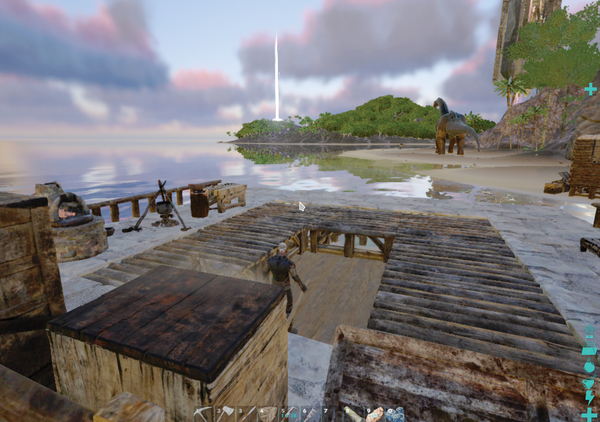 ARK ran smoothly on the PC with GTX 750Ti graphics. When the settings are moderate, it has sophisticated textures and anti-aliasing. The game was just barely playable on the IdeaPad laptop, and then only with graphics settings that make a carefully designed game look like an experiment from the 1990s (Figure 5). Figure 5: The textures appear flat and the horizon is small on a laptop with the GT 620 GPU; however, the low-resolution settings make it possible to play the game on slower systems. Therefore, if you are on the go and want to see tame dinos eat, you can make do with a mobile system. However, the real fun comes with more power. The various modes and extensions also need a system with more vigor because they include multiple super monsters and entire maps. Since the middle of May, an especially detailed map,"The Center," has been available as an official ARK add-on.